The Political Economy of Government Auditing addresses the elusive quest for greater transparency and accountability in the management of public finances in emerging economies; and, more specifically, it examines the contribution of autonomous audit agencies (AAAs) to the fight against corruption and waste. Whilst the role of audit agencies in curbing corruption is increasingly acknowledged, there exists little comparative work on their institutional effectiveness. 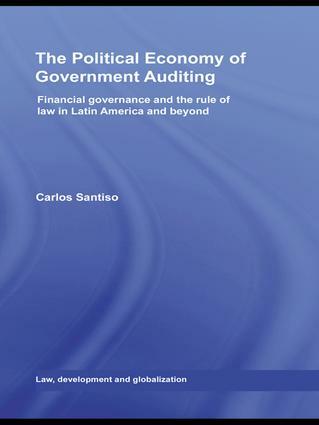 Addressing the performance of AAAs in emerging economies, Carlos Santiso pursues a political economy perspective that addresses the context in which audit agencies are embedded, and the governance factors that make them work or fail. Here, the cases of Argentina, Brazil and Chile are examined, as they illustrate the three – parliamentary, court and independent – models of AAAs in modern states, and their three distinct trajectories of reform, or lack of reform. Beyond Latin America, considerations on the reform of government auditing in other countries, developed and developing are also taken up as, it is argued, while institutional arrangements for government auditing matter, political factors ultimately determine the effectiveness of AAAs. Reforming AAAs, it is concluded, must consider the trajectory of state building, the role of law in public administration and the quality of governance. An important contribution to the comparative study of governance institutions, and especially those tasked with overseeing the budget and curbing corruption, The Political Economy of Government Auditing will be of interest to scholars and students of comparative politics, development studies, administrative law, and public finance; as well as to development practitioners and policy-makers in developing countries, donor governments and international institutions.